Dubai, United Arab Emirates: As the Kingsman Dubai Sugar Conference returns to the city for the 11th consecutive year, Al Khajeej Sugar is taking on hosting duties alongside Platts, a leading global energy and petrochemicals information provider and the owner of Kingsman since 2012. The event, running from the January 31st to Feb 3rd 2015, will be held at the Grand Hyatt Dubai, and attract some 620 producers, importers refiners and analysts linked to the sugar industry from 40 plus countries. Al Khaleej Sugar, the region’s largest sugar refinery that supplies the international market with around 1.5 million tones of fine and course sugar, has been a regular part of the Dubai Sugar Conference since its launch 11 years ago. During that time, the conference has seen exponential growth – from 50 participants in 2005 to over 650 in 2015. The event has grown into a de facto platform for stakeholders to discuss events shaping their industry, explore opportunities and stay abreast of challenges. Business networking is an essential component of proceedings. 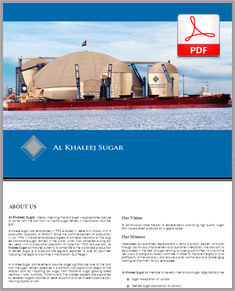 For Al Khaleej Sugar, this iteration of Platts’ Kingsman Sugar Conference is of particular significance, coming after the company’s recent purchase of the biggest marine sugar vessel in the world. 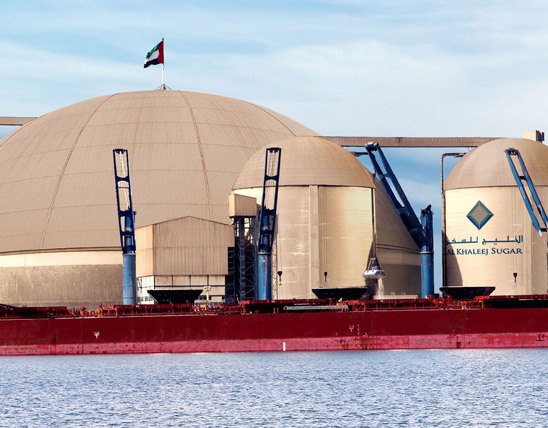 Parked at their Jebel Ali berth, the ship has unloaded 106,000 tons of raw sugar to be safely stored in the Al Khaleej store silos and dome. To cope with larger volumes, Al Khaleej has also upgraded its storage capacity to 1.4 million tons of sugar. As part organizer and host of the 2015 event, Al Khaleej Sugar will ask its Managing Director Jamal Al Ghurair to open the day’s proceedings on Feb 1st 2015 with a keynote at 9:00 am. Adding to a lineup of international expert speakers, Platts’ Kingsman Dubai Sugar Conference 2015 is also hosting a Sugar Learning Curve workshop designed for different levels of industry skill. “2014 saw interesting variables in the sugar market, and we look forward to new challenges in 2015. We’ve further improved our refinery – as we do every year - and we are proud to bring the largest sugar carrying marine vessel in to our berth in Dubai. And we appreciate the supportive role of the Dubai Government represented by His Highness Sheikh Mohammed bin Rashid Al Maktoum, and the constructive cooperation from Jebel Ali Port’s management in supporting our company’s success, ” Al Ghurair concluded.